Ocean Strategies is hosting a discussion panel at Pacific Marine this Sunday from 1-2pm that will dive into federal fisheries policy issues on the docket for the current and upcoming Congress. We’ll look at the suite of legislation aiming to reauthorize or make changes to the Magnuson-Stevens Act, and talk about the implications of those bills with panelists that can bring us a coast-to-coast perspective. Ocean Strategies’ senior consultant and Gulf of Alaska fisherman Hannah Heimbuch is facilitating, and we’ll be hosting panelists Bob Kehoe from the Purse Seine Vessel Owners’ Association and Jason DeLaCruz from Gulf of Mexico Reef Fish Shareholders Alliance. These different perspectives should make for a rich discussion. COME SEE US AT PACIFIC MARINE EXPO! If you’re attending Pacific Marine Expo, be sure to stop by our booth #4125 to renew your membership and get a newly designed sweatshirt designed by Petersburg’s own Shalene Zellweger Mccollum of AK Island Design! A huge thank you to Shalene for the donation of her artwork specifically crafted for UFA! As always, there will be an assortment of UFA staff, board members and lifetime members in the booth, so stop on in for a chat and renew your membership while you’re at it! SENATE PASSES THE COAST GUARD AUTHORIZATION ACT OF 2018 94 TO 6. There is still one more step to go. This bill has changed from what the House passed so it will need to be voted on again by the House. However, Matt just spoke with Young’s office and got conformation that everything in the bill was preconferenced with the house and it should have no problem passing. There is a slight administrative issue with some of the paperwork the senate filed and the Coast Guard Subcommittee is working through that, but it should be worked out quickly and after Thanksgiving it should pass under suspension which is a procedure used in the House to pass non-controversial bills. The National Weather Service (NWS) Headquarters is considering making changes to marine products that many of you use routinely here in Alaska. They want to hear your voice! 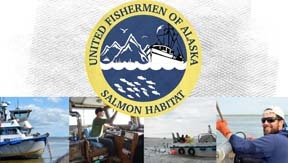 If you are interested in participating, contact rebecca.heim@noaa.gov with your name, affiliation, email, location, and availability to participate in Anchorage or via webinar. NOAA Fisheries has published a proposed rule today, November 2, 2018, and is taking public comments through December 17, 2018. The rule proposes to revise NOAA Fisheries Finance Program rules, procedures, eligibility criteria, loan terms, and other requirements to add financing to construct fishing vessels or reconstruct fishing vessels in limited access fisheries that are neither overfished or subject to overfishing. Comments on the proposed rule are welcome. If you have specific questions on the program please contact Earl Bennett at earl.bennett@noaa.gov or 301-427-8765. Click HERE for the proposed rule. Come hear what NOAA Fisheries and University of Washington scientists have to say about the effects of ocean acidification on Bering Sea crab, the latest bioeconomic projections, and how global climate models that integrate ocean acidification and other factors can provide insights into future fisheries. The full program for the Expo talks/panels is here.